Winter is almost here, a time when snow is on the ground and a chill is in the air. But the cold weather doesn't mean it's time for the little ones to hibernate. Children need to stay active all year long. "The days may be shorter and colder, but there are plenty of ways that children can get exercise during the winter," said Fidelis Care Chief Medical Officer Sanjiv Shah, MD, MPH. "Making sure children stay active and healthy is one of the best holiday gifts that parents can give them." Building a snowman or sledding can be lots of fun. When heading outdoors in cold weather, children should wear a hat, scarf, mittens or gloves, coat, winter boots, and several layers of loose-fitting clothing. It's also important for children not to stay outside in wet clothing. Being wet increases the risk of hypothermia and frostbite. If children get wet outside, they should go indoors, change into dry clothing, and warm up before heading back out. Parents should also monitor children to make sure they are not experiencing any warning signs of hypothermia. 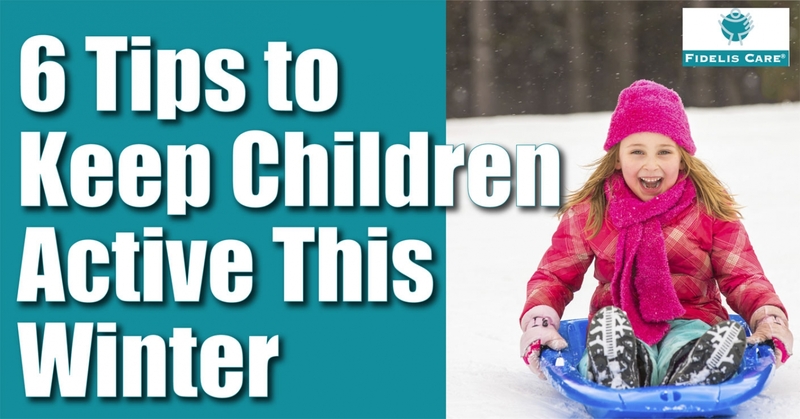 If a child can't stop shivering, is having trouble breathing, or is becoming tired or nauseous, then he or she needs to get inside and warm up. If you think your child is suffering from hypothermia, call the child's doctor or 911. Winter weather might keep children from some of their usual activities. If the neighborhood playground is snow-covered, then consider visiting a community center, recreation center, the YMCA, or a children's gym. Many offer indoor activities, such as basketball and kickball. For younger children, just giving them a place to run around can make a big difference. They will get some exercise and burn off energy. Children and adolescents should get 60 minutes (1 hour) or more of physical activity each day. If your child has any health concerns, talk to his or her doctor before the child starts exercising. Put on some music and let the kids dance in an open area. You can even have a friendly competition with them. If dancing's not their thing, look for other fun solutions. Many video game systems offer interactive games that can get children off the couch. Even building an indoor fort out of pillows can help children get some exercise. Every little bit counts! Walking around a museum and looking at exhibits is a great way to get some exercise. And an added benefit is children are learning at the same time. Many museums have interactive areas or special crafts for children. Visit museum websites or call them for more information. Another fun winter activity is to lace up some skates and get on the ice. Children and those who are learning how to skate should wear a helmet to be safe. Dress warmly when going skating, and follow the rules of the rink. Don't skate on ponds or lakes unless you know the ice is safe. Visiting a bowling alley is another fun indoor option. Many bowling alleys can set up lane bumpers to keep children from getting gutter balls. Instead of hitting the snack bar, pack some fruit for a healthy treat. So don't let your children get discouraged by the gray days of winter. Help and encourage them to safely experience the beauty, fun, and joy of the season. They will be healthier and happier!